Fibrocell Science Inc (NASDAQ: FCSC) shares rose 51.7 percent to $2.70 in pre-market trading after the company disclosed an agreement with Castle Creek Pharmaceuticals to develop and commercialize FCX-007. Fibrocell will receive a $30M upfront payment. Bio-Path Holdings Inc (NASDAQ: BPTH) rose 39 percent to $21.75 in pre-market trading after the company withdrew its S-1 registration form, indicating it will not dilute shares. Asure Software, Inc. (NASDAQ: ASUR) rose 28.2 percent to $8.27 in pre-market trading. Electronics For Imaging, Inc. (NASDAQ: EFII) shares rose 25.2 percent to $36.82 in pre-market trading after the company agreed to be acquired by an affiliate of Siris Capital Group, LLC in all-cash transaction valued at approximately $1.7 billion. Phunware Inc. (NASDAQ: PHUN) rose 24.7 percent to $10.21 in pre-market trading after the company announced an agreement with Endpoint IP to monetize its mobile patent portfolio. 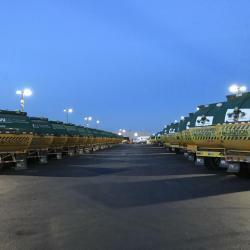 Advanced Disposal Services, Inc. (NYSE: ADSW) shares rose 18.7 percent to $32.21 in pre-market trading after the company agreed to be acquired by Waste Management, Inc. (NYSE: WM) for $33.15 per share in cash for a total value of $4.9 billion. Summit Wireless Technologies, Inc. (NASDAQ: WISA) rose 18 percent to $2.70 in pre-market trading after gaining 17.19 percent on Friday. Gogo Inc. (NASDAQ: GOGO) rose 14.7 percent to $4.84 in pre-market trading after the company said it expects Q1 EBITDA to be higher than initially expected. Amyris Inc (NASDAQ: AMRS) rose 13.3 percent to $3.25 in pre-market trading after the company issued an update on resolution of April 2019 convertible note maturity. Viacom Inc. (NASDAQ: VIA) rose 11 percent to $40.00 in pre-market trading. Jumia Technologies AG (NYSE: JMIA) rose 8.8 percent to $27.70 in pre-market trading after gaining 75.59 percent on Friday. Sorrento Therapeutics, Inc. (NASDAQ: SRNE) rose 8.7 percent to $4.51 in pre-market trading after the company expanded resiniferatoxin clinical development program to life-threatening cardiovascular diseases with completion of major animal toxicology study. ATA Inc. (NASDAQ: ATAI) rose 8 percent to $2.70 in pre-market trading after falling 18.03 percent on Friday. Vectrus, Inc. (NYSE: VEC) rose 7.6 percent to $32.00 in pre-market trading. Safe-T Group Ltd (NASDAQ: SFET) shares rose 7.6 percent to $2.84 in pre-market trading. Safe-T introduced user and entity behavior analytics capabilities to the world of Software-defined Perimeter. Osisko Gold Royalties Ltd (NYSE: OR) rose 7.1 percent to $11.84 in pre-market trading. Axalta Coating Systems Ltd. (NYSE: AXTA) rose 6.9 percent to $29.00 in pre-market trading. Axsome Therapeutics, Inc. (NASDAQ: AXSM) rose 6.8 percent to $14.38 in pre-market trading after the company's AXS-05 Met its Primary Endpoint in a Phase 2 smoking cessation trial. Charles Schwab Corporation (NYSE: SCHW) rose 3.7 percent to $47.00 in pre-market trading after the company reported better-than-expected Q1 EPS and revenue results. Reebonz Holding Limited (NASDAQ: RBZ) fell 62.1 percent to $4.35 in pre-market trading after the company reported pricing of $10.8 million underwritten public offering. Achaogen, Inc. (NASDAQ: AKAO) fell 55.2 percent to $0.2220 in pre-market trading after the company filed for chapter 11 bankruptcy protection. Assembly Biosciences, Inc. (NASDAQ: ASMB) fell 25.5 percent to $14.00 in pre-market trading after the company presented interim data from two Phase 2a studies of ABI-H0731 in HBV-infected subjects in a late-breaker oral session at the EASL 2019. Aphria Inc. (NYSE: APHA) fell 13.1 percent to $8.78 in pre-market trading after announcing worse-than-expected Q3 EPS and revenue results. Clovis Oncology, Inc. (NASDAQ: CLVS) fell 9.5 percent to $21.25 in pre-market trading after the company announced it would stop its Phase 2 ATLAS study of Rubraca. Castor Maritime Inc. (NASDAQ: CTRM) fell 7 percent to $5.35 in pre-market trading after rising 14.09 percent on Friday. Marathon Patent Group, Inc. (NASDAQ: MARA) fell 7 percent to $3.08 in pre-market trading. CHF Solutions, Inc. (NASDAQ: CHFS) fell 6.8 percent to $3.8567 in pre-market trading. DHI Group, Inc. (NYSE: DHX) fell 5.4 percent to $3.00 in pre-market trading. QuinStreet, Inc. (NASDAQ: QNST) fell 5.1 percent to $12.59 in pre-market trading. Alliance Data Systems Corporation (NYSE: ADS) fell 4.1 percent to $173.50 in pre-market trading after the stock was downgraded by Stephens and BMO capital following the $4.4 billion sale of its Epsilon division.